RBTH examines the tradition of the so-called “yolka” – a special New Year’s show for children that takes place throughout Russia before the New Year holidays, in venues ranging from the Kremlin to the simplest of daycare centers. At the end of the 1920s, because of the unofficial ban on religion, Russians virtually ceased to celebrate Christmas, at least officially. But it was replaced in 1935 by another winter holiday – New Year. Without much thought, the decision was made to leave the Christmas tree as the official symbol for New Year. Now, however, the tree symbolized winter, while the star atop the tree went from symbolizing Bethlehem to symbolizing the Soviet Union, acting as a cousin of sorts to the ruby stars that crowned the Kremlin. The Soviet authorities sought to promote a culture of the masses, which transformed what was traditionally a family holiday into a public holiday. National celebrations were organized for Soviet adults in houses of culture and in public squares. Meanwhile, children gathered at stadiums, daycare centers, and even military grounds to celebrate a “yolka” – a holiday concert where children watched costumed performances, took part in competitions, and received gifts. 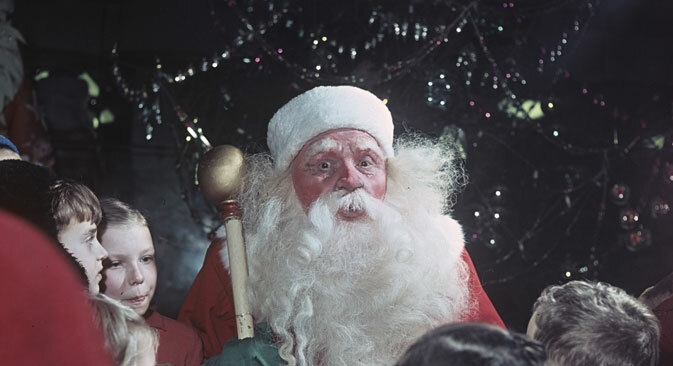 Thanks to these shows, New Year became one of Soviet children’s favorite holidays. The scripts of the yolka concertswere imbued with short-term ideological goals and were obligated to reflect the achievements of the USSR in a way that was accessible to children. For example, the launch of Sputnik 1 in 1957 heralded the beginning of the “space period” in staged performances. The basic outline was always simple and clear: The forces of evil were trying to prevent children from celebrating the New Year holiday, the forces of good would overcome, and the situation would stabilize just in time for the clock to strike midnight. The forces of good were Grandfather Frost (the Russian version of Santa Claus) and his helpers, while the forces of evil could be various characters from fairytales and folklore, such as Bag of Bones, Baba Yaga, pirates, or robbers. The Kremlin yolka, held at the Kremlin Palace of Congresses, was the most coveted New Year party among Soviet children. Only the best students and the children of well-connected parents such as party workers were invited to attend. It was believed that the show was most colorful and the gifts best at the Kremlin yolka. Children who managed to get invited to this elite party bragged to their classmates about the tasty candy and amazing gifts long after the event. An interesting feature of the Kremlin yolka was that parents were not allowed to attend, the aim being to give more children the opportunity to take part. Upon entry to the Palace, children were greeted by clowns, bunnies, and squirrels, escorted to the coat check, and led in dances – a tradition that has been preserved to this day. After the show, children left the Palace of Congresses and were paraded around like luggage on an airport carousel as their parents picked them out from the crowd. Even though religion is back in favor in modern Russia, and despite the fact that about 80 percent of the population considers itself Orthodox Christian, the yolkaremains a purely secular celebration. Orthodox Christmas is celebrated on Jan. 7, while shows for children begin at the end of December, when Christians should be observing the fast. Yolka concerts still enjoy an enormous audience. Tickets to the New Year shows are publicly available, and any parent can choose a show based on his or her tastes and financial state – fairytale performances, shows on ice, and even scientific experiments at the Polytechnical Museum in Moscow. Children can visit dozens of various yolka concerts during the New Year holidays. Together with the collapse of the Soviet Union, ideology was also removed from the New Year shows. For example, this year a yolkabased on The Wizard of Oz will be held at the Luzhniki Sports Complex. Although it may seem unpatriotic to stage a show based on an American book when relations are so strained with the United States, the charm of a fairytale is above political issues. VIDEO: The RBTH team and … the Clay Sheep wish you a Happy New Year!